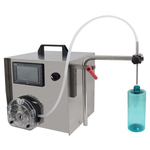 It is the best system to avoid contamination, product is only in contact with the medically approved tubing and the nozzle, against cross contamination and easy cleaning. It is the best candidate with the consideration of budget. 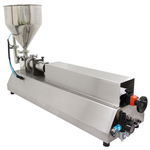 The volumetric piston filler draws liquids and other low viscosity products such as oils or juices directly from a tank or drum It is the simple design, low failure rate and fully operated by air. It is suitablely applied on sticky liquids such as shampoo, hand washing and dish soap. 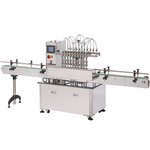 Furthermore, the Liquid Filling Machine also could be used for sticky foods such as honey, syrup, ...etc. available for working independently on each system. Cylinder Volume can be customized based on customer's requirement. 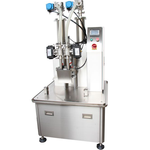 It is designed and engineered to produce outstanding quality and precision filling suitable for various products like shampoo, hot sauce, lubricant oil etc. 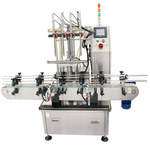 It is able to achieve the output with 250ml per second by sophisticated module of gear pump and make the liquid filling to be best performance. 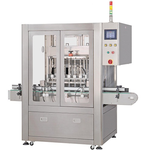 Gear pump filling module is your top choice to meet your high speed and accuracy filling requirements. 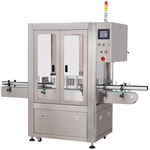 Besides, PLC and Touchscreen system brings more benefits for easy operation. Each nozzle equip with individual pump, making sure the stability. Diving nozzle to avoid foamy effect. Controlled by PLC, operated through HMI, memory set. 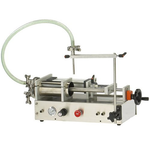 Tabletop Overflow Filling Machine FL-120 is suitable for Water like(1cps), non-granule, non-foamy liquid. provides a versatile method for filling water-thin to medium, and produce visually appealing and consistent fill levels regardless of container shape or irregularities. 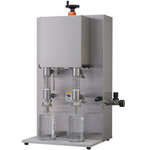 Weighing Filler is suitable for all kinds of High consistency, High viscosity, such as condensed milk, machine oil, shampoo, cosmetics and granule juice. 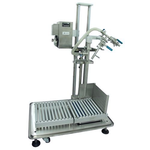 BR-4125 always comes with bottle filler and tablet counter to meet cGMP regulation. 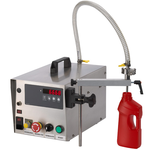 Air or water rinsing even combo machine can be selected by customers needs.